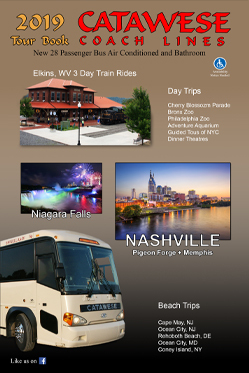 Choose Catawese Coach Lines, Inc. to handle all aspects of your tour planning needs such as booking hotels, making meal reservations, purchasing tickets and planning your complete itinerary. Our experienced, friendly tour planners will take the time to make sure your needs and special requests are met and exceed your expectations. Tours can be arranged for any destination of your choice and itineraries customized to meet your group’s requirements. Group travel means cost-effective fun for everyone! Whether you are planning a class trip, a performance tour, a garden club outing or a Red Hat adventure, you will be pleased with Catawese’s friendly professionalism from beginning to end! Our experienced charter department can help you plan an unforgettable trip of a lifetime and do all the work: purchasing tickets, arranging overnight lodging and organizing your schedule. We’ll offer your group the highest standards in tour planning. Rest assured that with a professionally trained coach operator your group will arrive safely to your destination. Plus, all of our deluxe coaches feature air-conditioning, VHS/DVD units, public address system, reclining seats, individual reading lights, panoramic windows, and restrooms.